Birth of James Bates registered June quarter 1887 at Dudley. 48 Regent Street, Woodsetton, Coseley, Staffs. James Bates (35, Engine Driver, born Hurst Hill), his wife Mary Ann (36, born Swan Village), and their 5 children: Betsey (16, Helps at Home, born Swan Village), William (12, Scholar, born Swan Village), James (4, born Swan Village), John (1, born Swan Village), and Benjamin (1 month, born Swan Village). 2 George Street, Woodsetton, Coseley, Staffs. James Bates (46, Engineer at a Brickworks, born Sedgley), his wife Mary Ann (47, born Sedgley), and their 4 children: James (14, born Sedgley), John (11, born Sedgley), Benjamin (10, born Sedgley), and Maria (7, born Sedgley). Marriage of James Bates and Ada Holt registered in June quarter 1909 in Dudley. James Bates (24, Coal Miner Underground – Horse Driver, born Tipton), his wife Ada (19, born Tipton), and their 2 children: Sidney (1, born Tipton) and Alice (2 months, born Tipton). 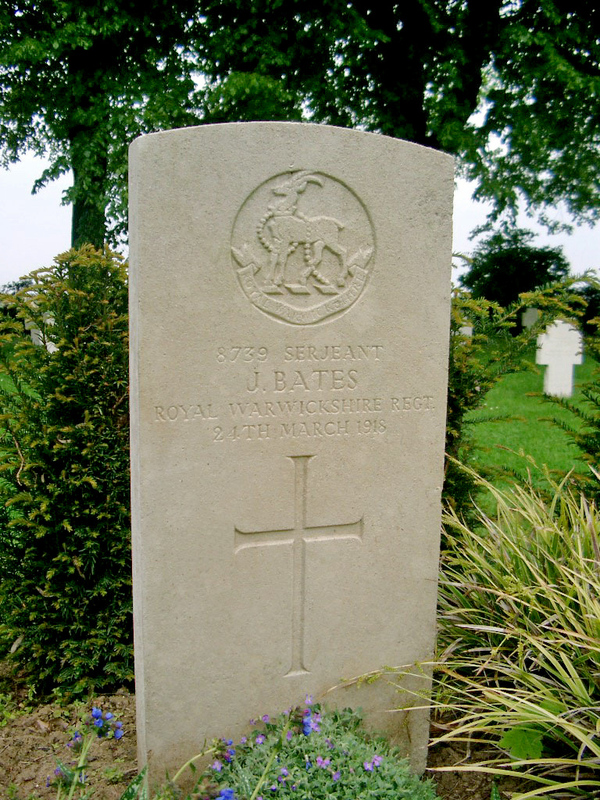 James Bates volunteered for the Royal Warwicks in October 1914. He was a married man with a family of probably 5 children and was employed as a miner at Mr William Elwell’s pit. After initial training, he landed in France on July 31st 1915 with the 10th Royal Warwicks in the 19th (Western) Division. James had been wounded in June 1916, and gassed in January 1918. James was wounded in action on 23rd March 1918 and was reported as missing since that date. Some 7 months later in October 1918, the Tipton Herald reported that the Royal Warwicks Infantry Record Office had informed Ada of her husband’s death: “[He passed] in the field hospital, Cambrai, on the 24th March 1918. The report is to the effect that he dies from a gun-shot wound in the left arm, and was buried in the cemetery at Cambrai.” The report does not say that he died as a prisoner of war, but as there were no British field hospitals within 15 miles of Cambrai, there is no doubt. It is likely that James remained wounded on the battlefield as his comrades retreated, and was taken prisoner of war by the advancing German troops. He was evacuated by them back to a German hospital facility to the east of Cambrai, a distance of about 12 miles. Cambrai had been occupied by German forces in August 1914 and it remained in German hands until October 1918. The following Tipton soldier is reported wounded:- Sergeant J. Bates of the Warwicks. Mrs Bates, of 7 Lion Yard, Park Lane West, Tipton, has received the following from the Infantry Record Office, Warwick:- “Madam, it is my painful duty to inform you that a report has been received from the War Office notifying the death of Sergt. James Bates, 10th Royal Warwickshire Regiment, which occurred in the field hospital, Cambrai, on the 24th March 1918. The report is to the effect that he dies from a gun-shot wound in the left arm, and was buried in the cemetery at Cambrai.” Sergeant Bates was 31 years of age. 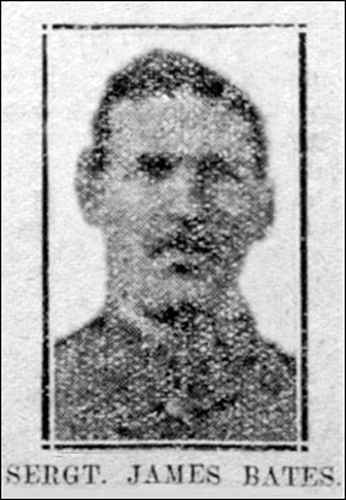 He enlisted in October 1914, and has been in France three times. He was wounded in June 1916, and gassed in January of this year. The deceased soldier had been reported wounded and missing since March 23rd. He leaves a widow and family. Before joining up, he was a miner in the employment of Mr William Elwell, and was greatly respected by his workmates and his many friends.